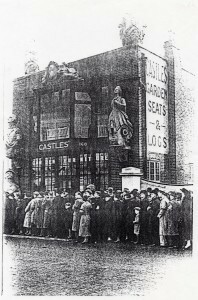 The picture above, taken from our archives, shows the queue passing in front of the Castles head office building in 1936 in order to view the lying in state of George V in Westminster Hall. The distance involved was considerable and the queue would have wound all the way down Millbank from the Houses of Parliament at Westminster Bridge to the Castles Shipbreaking offices at Vauxhall Bridge. They would have had a long wait.